Cold forged pins to 1 1/8"dia for consistent grain flow, maximum strength and superior surface finish. Large radius at fracture point (difficult to achieve in cold forging). Guaranteed base material to min. specifications S1040 carbon steel. 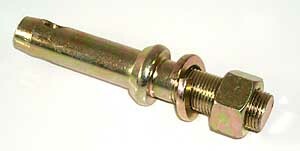 All pins correct length to accept stay bars or next linkage category bush upgrade. Various length stepped shoulders replaced by straight shank to increase strength and reduce your inventory. Stepped types available for 40 year old Ferguson tiller and mowers. Only BARE-Co have invested in special thin wall nuts, to provide clearance for straight shank design on plow cross shafts etc. SHOULDER/SHANK DIA (IMPLEMENT HOLE DIA) TRACTOR HITCH CATEGORY (PIN DIA) PART No. CAT 2 = 1 1/8"
CAT 3 = 1 7/16"
NOTE: standard cold forged pins (B200 above / B215 etc below) are much CHEAPER than the pins below! Extra Long Thread Shank: "A" = 3"
A = 3 1/2" B = 2 1/8"
A = 2" B =3 1/8"
A = 2 1/8" B = 4 5/16"
NOTE: standard cold forged pins (B200 above / B215 etc below) are much CHEAPER than the pins above!